I guess Indies restaurants are easier to find when you’re looking because I am running into them everywhere. I try to at least have a look around, have a cup of tea or coffee, and in some cases go looking for a perfect dining experience. Anyone who knows me would likely never describe me as a “foodie”. I have however always thought that travelling and eating well go hand in hand; that does not necessarily mean eating expensively. 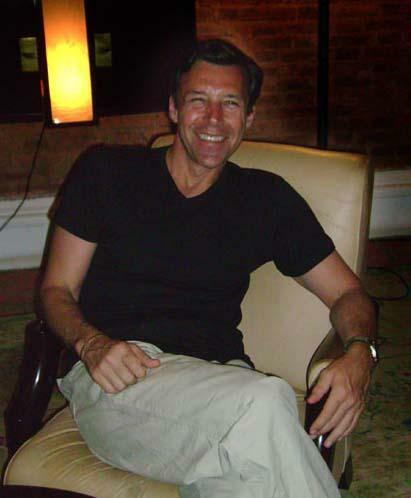 With this in mind I have listed restaurants that blew me away with their ambiance, history, and service. Or, they were so incredibly basic and had few, or none, of the above three qualities but the food was great and the experience was awesome for all sorts of other reasons. How often do you get to swim in the ocean at the same time as the fish you are about to eat only a few minutes later…and cooked to perfection! Located in the Tjideng area it is one of the last remaining houses on Laan Trivelli. In 2006 the family turned their house, where they were living, into a restaurant dedicated to the cuisine of the Indies and Tempo Doeloe. The family has a heritage in Jakarta of over 300 years and can trace this heritage all the way back. Photos, documents, and mementos adorn the walls, shelves, and every available inch of space in order to tell their story. I met with the owner and his brother who was visiting from Amsterdam and over the next three hours these two placed in front of me a wide selection of appetizers, salads, fruit, krokets, Ox tongue, sweets of all kinds, coffee and tea. The tongue especially brought back memories of my mother creating this dish. Coming home from school only to find the big red cauldron on the stove with a cows tongue hanging over the top. Friends were grossed out but I loved that meal and eating it again at a restaurant was a real treat. Located in the main square of Jakarta’s old town I was drawn in and immediately captivated. The building itself dates back to the 18th century. The entrance opens onto a sweeping dark wood staircase buffed to a high sheen. Upon this you are able to sashay yourself to the upper level where you enter another era. Glenn Miller playing in the background enhances the mood. Potted palms, tropical flowers, crystal chandeliers, aged wood pillars adorned with black and white photos, crisp white linen, and floor to ceiling windows. A combination of elegance and class. For me this meant just one thing. James Bond! I returned in the evening dressed in my finest clothes, took a seat at the wrap around bar and ordered my first ever martini. ..shaken, not stirred! This restaurant in Bandung’s Jalan Sumatra was about as Indies as you can get. Just like on Laan Trivelli the ambiance was perfect; antiques everywhere. The patio where we sat was surrounded by palms and the furniture, rattan. Inside there is an old but functioning cake and pastry shop that sells homemade sweets and cookies. Even the cash register is a period piece. The floors on the inside are dark wood, as is the furniture. The ceilings are high and from them drape large crystal chandeliers. The menu is all Indies consisting of beef, and chicken, cooked the Indies way and sweets like Ollie Bollen. Sitting on the veranda drinking tea, or coffee, or juice you can certainly transport yourself back in time as you get enveloped by the colonial atmosphere. This very private, old and grand country club is now open to the public. Events and music festivals are held here regularly. I was told that many come here solely for the entertainment but my experience led me to believe this was one of the best meals I had in Bandung. I started with an exotic fruit salad consisting of strawberries, apples, melon, and pineapple drizzled in a moussellin sauce. Then moved onto the Homemade Pea soup and anyone who knows me knows that this is an area in which I excel…have kind of a passion for the pea. The soup had a dollop of cream in the center and surrounding that were small flecks of bacon. I then moved onto something very Asian in Bakmei Goreng, again with an intermittent sprinkling of peas and a side of sliced vegetables. To follow-up I had a Triangle Grand Marnier Spice Cake with vanilla and blackcurrant ice-cream served with a fruit compote and an orange sauce. Even though suspicious that they had placated my pea obsession I left adoring every mouthful. I know its wrong but it feels soooo good to wake up and enjoy a bowl of ice-cream from a guy on a bike. How can you resist a guy who rides a bike encircled by glass sundae cups and carrying a grin from ear to ear. In the middle of the bike are huge vats of homemade ice-cream, just one kind mind you, and for IDR3000 you get a cup full…REALLY FULL! That was breakfast and I felt good even though a little guilty…of what I’m not sure! Giving in to feelings of guilt I decided healthy was the way to go. I ordered an ice tea and a green salad…”Please hold the mayonnaise dressing onto the side, terima kasih”. The salad consisted of a lettuce base encircled by tomato onion cucumber rings, and an arsenal of beans. The mayo dressing came on its own plate and stayed there. This was one of those meals that would never fall into the culinary experience category but I did leave feeling healthy and hey, that was the whole point! The restaurant itself is located in an old Dutch house that remains perfectly intact. No walls have been removed to make it more open. The owners have worked with what they have and decorated the place accordingly. The dinner menu has a good selection of Italian food as well as Indonesian dishes. A Javanese themed restaurant with a Balinese feel. A lot of dark wood, sheer white drapes, blooming flowers and perfectly manicured lawns. This restaurant has a real zen feeling to it. As you enter the restaurant you walk through a long hallway and into the foyer. Water features lay in wait everywhere and as you hear the conspicuous plop you understand that frogs have also taken up residence. The inside is Asian modern with a lot of deep reds and impressive wood carved statues adorned with purple and white orchids. Green plants add to the beauty and small blooming flowers lay at the center of each table. I ordered a hot tea and a Javanese steak with lyonnaise potatoes and steamed vegetables. The sauce a thick mushroom gravy. When the two combined it was one of those steaks that just melts in your mouth. Ok, I couldn’t do it. It was only 11:30am and I couldn’t fit another mouthful in. I will try to return but just in case I don’t make it back. The place looked like a fine establishment and just off of Ijen in a distinctly colonial area of Malang. They have a stage in the center and nightly live music. The menu consisted of European, Indonesian, and Chinese fare. 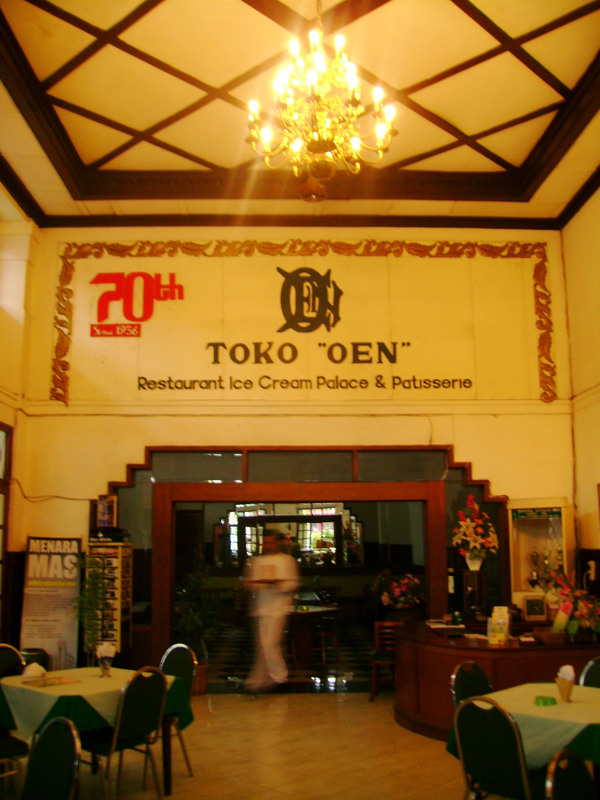 No trip to Malang would be complete without a visit to Toko Oen. The pictures below speak for themselves. I returned here five times! After all this time in Indonesia I had yet to satisfy my appetite with a good beef rendang. This is a dish from northern Indonesia but can be pretty much found all over and if its done right, it’s incredibly flavorful. Rendang is cubes of beef tenderloin that have simmered for hours in a variety of spices and coconut milk. The sauce thickens, the meat melts in your mouth, and whether you have it with rice and vegetables or potatoes and vegetables the end result is the same. One of the best meal to be had in Indonesia. I had mine with mashed potatoes and I am hard pressed to think of a meal that can compare. I left this seaside restaurant with sand between my toes, a $5 receipt, and a meal I raved about for the next three days…to anyone who would listen. A tuna is caught at 11:45 am. By 12:15 that same fish is grilled to perfection in a spicy sauce; served with vegetables, rice, and a bowl of sambal for extra kick. You don’t get much fresher than that! For 30,000 rph or $3 this was my lunch. Sitting on the beach twenty feet from the edge of the ocean, eating with your fingers even though a fork and knife are provided…life for me does not get much better than this. For a while I have been hearing about this restaurant in Ubud that has its own farm and everything made in the kitchen is grown just outside the front door. It sits in the middle of a rice field with breath-taking views. I had a day of cycling that ended with a meal here. It’s a bit of a trek to get to but once you wipe away the sweat the environment you find yourself in is picture postcard Bali. A cool refreshing juice followed by a classic Nasi Campur and your all set to put pedal to the paddy and head back into town. That first restaurant, Cafe Batavia, is really elegant looking. You really feel the need to dress up to eat in such a place. I also love Beef Rendang but rarely find it here in Sacramento. Love the fact that you focused on local food and truly embraced each restaurant and their menu. Do you find the food spicy for your taste or just right? The food looks amazing, I’m going to have to find a way to go there. Lots of restaurants for Indie foods. Judging from your photos, it seems the Indie dishes are yummy. I totally agree with what you said…that traveling and dining go together. hahaha! well, here in our country, there are a lot of Indians here but it’s weird that we don’t have many Indian restaurants. Yes, one can sense the colonial atmosphere in Bandung, at least that is what I read in other chronicles too. Wow, I would really love to taste sweets like Ollie Bollen, cause I love delicious sweet stuff. However, I am a vegetarian and beef and chicken would be too much for me, lol. Great photos, by the way! Oh my gosh, the food in this blog got me instantly hungry!